The oversized, yet graceful script seems to float across the page. 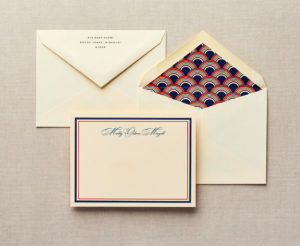 The painted ombre edge and envelope liner options add a crisp accent of color to this formal set. For 100 sets, pricing starts at $13.50 per set for Flat Printing, $16 per set for Flat Premium and $19 per set for Letterpress Printing.